The University of Southampton is launching a Cyber Security Academy to help make government, businesses and consumers more resilient to cyber-attack. The Southampton Cyber Security Academy (CSA) is a partnership between the University of Southampton and world-leading industry and Government partners to provide a focal point for cyber security research, education and outreach. The first partners of the Academy are the Defence Science and Technology Laboratory (Dstl), Northrop Grumman and Roke Manor Research with further partners across a range of industries joining as the Academy grows into a vibrant community of businesses, centred in the South of England but with global influence. 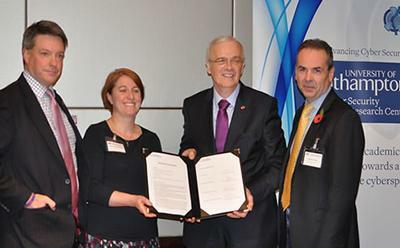 The CSA was announced at a special signing today (Monday 9 November) during the IA15 event in London, hosted by GCHQ and Department for Culture, Media and Sport and supported by leaders from across Government, industry and academia. The CSA is one of the first examples of the UK Government’s CyberInvest initiative, also announced at IA15. Professor Vladimiro Sassone, Director of the Academy at the University of Southampton, said: “The increasingly alarming statistics on cyber-attacks and crime on a variety of targets, such as the recent TalkTalk data hack, make the Academy a timely initiative fully aligned with the UK National Cyber Security Strategy. The CSA will provide a stream of cyber security graduates to industry and train existing workforce through an industry-relevant CPD program in Cyber Security. It will also lead innovative research, consultancy and enterprise activities, creating new employment opportunities by attracting companies and talented individuals interested in cyber security and related sectors. The University of Southampton is one of just 13 Academic Centres of Excellence in Cyber Security Research, leading the national agenda to protect against cyber threats. The University of Southampton was awarded ACE-CSR status in November 2013 by GCHQ with a remit to extend knowledge through original research and provide high-quality graduates in the field of cyber security.